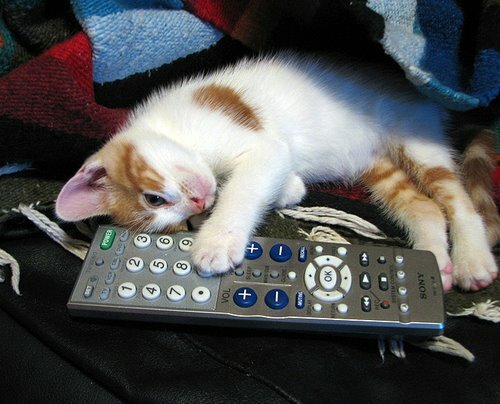 Which channel is "Tom & Jerry" on? Nope, my little Chrissy is Siamese -- and she's not so little anymore. She's pretty much Miss Omygawdhowmuchdidyoueattoday! You know December 26th will mark her first birthday, so she is near full grown, though she still plays like a kitten and cuddles like a baby. Supercute. The little guy collapsed after spending hours trying to operate the phone? Looks like a perfect day to me; lying on the couch with the clicker in my hand. All kitty needs is a bag of pretzels and a diet soda and that could be a picture of me. So what shows does she watch? "Last time I pushed this I got animal planet, now why am I getting Dr. Ruth?" Thanks for stopping by. 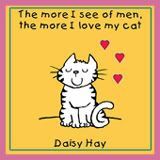 :) I love the pic, a kitty after my own heart. I am going to blogroll you because I keep forgeting that you are here. CFS you know. LOL! Very cute! Must think it's a mouse! Oh man, I. Want. A. Kitten.